This week in Davos (Switzerland) about 2000 people are gathering to talk about Polar Sciences! I (Lucie Vignes) am here to listen to a lot of talk about ocean dynamics, ocean-ice interactions but also talks about sciences-policy issues and women’s perspectives on Polar research! 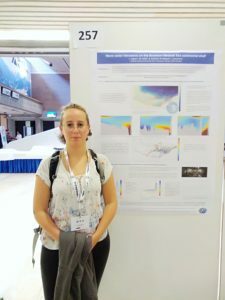 I came with a poster a well, speaking about both data from the Weddell Sea and our experiments in Grenoble. It was a good occasion to meet very interesting people and to share my research. This is my first big conference! As scientists it’s not enough to only do research alone in our little office, but we also need to get among other scientists to find out what new research is being done, to network and to make other’s aware of our important piece of work. Each year, there is a big European geoscience conference (EGU) in Vienna which again took place last week. 15000 scientists attended from more than 100 different countries and I (Nadine) was among them! In my luggage: A poster presenting our experiments at the Coriolis platform and some first results. This was very exciting, because it is a unique opportunity to talk to other scientists doing similar research. I was even co-convener in a session about the Southern Ocean which means I got to pick the talks and helped preparing everything in advance! After that week I was very exhausted, but happy! The program was stuffed with interesting talks and posters about Antarctica, oceanography, ice shelves, ice shelf—ocean interaction and glaciers and I got to talk to many skilled, interested and motivated scientists. All of them loved our experiments on the water-filled mary-go-round! 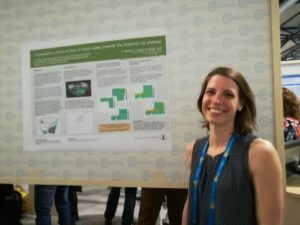 Happily presenting our poster at this year’s European geoscience conference (EGU) in Vienna!